From economy models with conditioning options to advanced center-pivot disc models, the rugged 1300 Series Hesston mowers are all you need to bring in your hay crop quickly - and in great condition. 1300 SERIES MOWERS: For a clean, close cut and efficient conditioning, choose the Series 1300 model that fits your farming needs. RELIABLE WORKERS: The 1300 series disc mower conditioners are designed to provide you with rugged construction and maximum adaptability. 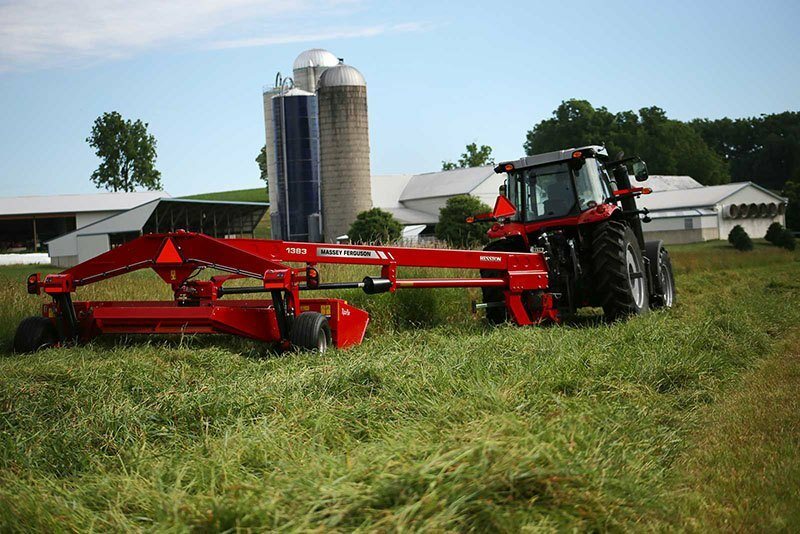 1300 SERIES MOWERS: Rely on the innovative features of the 1300 Series to cut a wide swath through grass hay, pasture or alfalfa with equal ease. HYDRAULIC ROLL TENSION: Both the 1386 and 1383 are equipped with hydraulic roll tension for the conditioner rolls providing the highest quality of crop conditioning. RAZOR SHARP: All models except the 1359 utilize the razorbar cutter bar. The Razorbar is a low profile spur gear driven cutter bar making it one of the most durable and shear-resistant cutterbars in the industry.